Joel Bray in Biladurang. Photo: Victor Frankowski. The dance/physical theatre on offer at this year’s Sydney Festival could best be described as diverse. 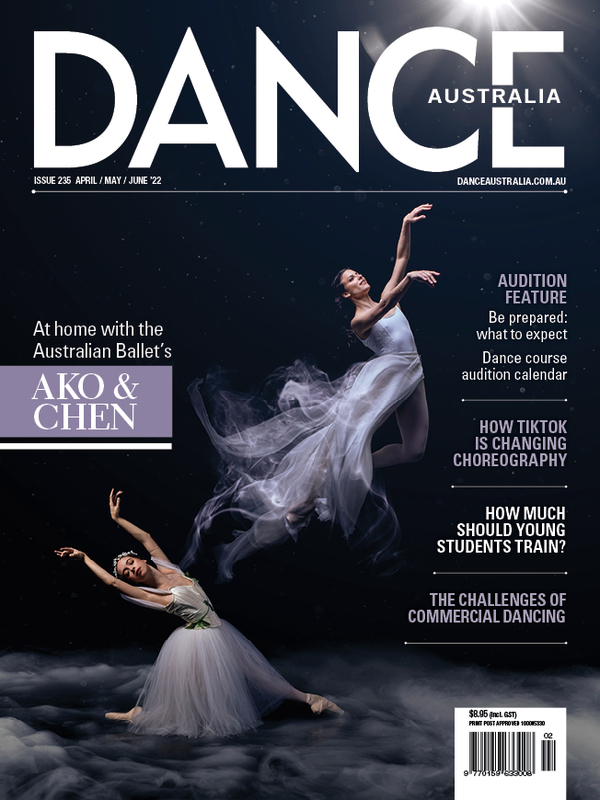 Australian artists and performers played key roles in many productions, and three performances reviewed here came to the 2019 Sydney Festival following appearances at the Melbourne or Brisbane Festivals in September/October 2018. Queensland’s Dancenorth brought Dust and co-produced and performed in One Infinity. Dust is an intriguing work, but somewhat nebulous, and as difficult to define and pin down as the material substance of dust itself. Directed and choreographed by Kyle Page and Amber Haines, it is described in the program notes as, “an investigation into the architecture of inheritance – the assortment of inheritance that we each accumulate on a personal, social, cultural and political level.” A towering, but moveable dividing wall (by set designers Liminal Spaces/ Elvio Brianese and Peta Heffernan) drives the work. As the piece progresses, the wall is moved around, and deconstructed into blocks which are, in turn, a focal part of the performance in the way they are rearranged throughout the work. The movement starts out hesitantly, mechanical in a way that suggests the predetermination of our genetic structure, what we “inherit” from previous generations. Yet as the work progresses it becomes increasingly virtuosic and expressive. Dancer Ashley McLellan was a standout, and the soft folds of semi-transparent fabric that made up each slightly individual costume (design by Harriet Oxley) gave the work an almost timeless aesthetic that contrasted sharply with the angular edges and concrete forms of the set. Dancers from Dancenorth and Beijing Dance Theatre came together with musicians Jun Tian Fang (a specialist in the ancient Chinese stringed instrument known as Guqin), and Australian recorder virtuoso Genevieve Lacey in One Infinity – a work with a meditative quality that immersed and engaged its audience. Directed and choreographed by Gideon Obarzanek, aspects of this performance happen in, around and within the seated audience, as well as on the stage space sandwiched between the tiered rows of seats. Audience members also become part of the performance at times, asked to mirror the arm and hand movements of a dancer seated opposite, at various stages throughout the show. It is quite interesting. Australian dancer Joel Bray brought his solo work Biladurang to a rather swish hotel room on the 10th floor of Sydney’s QT Hotel in Market St, Sydney. Limited to 20 audience members for any one-hour show, this felt more like a personalised experience than a performance. I have never really been a fan of the solo work, but this was really worthwhile. Bray was a generous and vulnerable host, and is a consummate storyteller. About fifteen minutes in he had the audience (including me) in the palm of his hand. The spoken parts of this work are equally, if not more important than the dance/movement aspects, but there was something quite fascinating about feeling the kinaesthetic energy of his movement so close to where we were seated – passively watching, with no clear dividing line between the performer's space, and that of the audience. Even getting up to the room was an experience in itself, from being met in the hotel lounge/lobby by a Sydney Festival representative, going up to the 10th floor in lifts (five or six people at a time), being briefed by a waiting assistant prior to knocking, and finally being admitted by Bray himself. Charming interactions: Alexandra Dariescu and Desiree Ballantyne in 'The Nutcracker and I'. Photo: Prudence Upton. The Nutcracker and I is the brainchild of Romanian concert pianist Alexandra Dariescu. It was well attended (with a significant proportion of young children) and enjoyed by those of all ages. There were only two people on stage, the pianist Dariescu and dancer Desiree Ballantyne (former soloist with English National Ballet). But with the help of animated projections, sets were conjured up around them, and other characters from The Nutcracker brought seemingly to life. As Clara, Desiree Ballanytyne did an excellent job of acting with and responding to the actions of her animated cast members. Particularly impressive was the rapport with her Nutcracker Doll/Prince as a central part of the story. I suppose it is not unlike the way actors work with a green screen, although their performance is not live in front of a paying audience. Dariescu, too, interacted charmingly with both Ballantyne and the other animated characters, at one point accepting a projection of a cup of tea, pretending to drink it, and then tossing the cup away into the wings. The two performers engaged with the technology in a spirit of charm and whimsy quite in keeping with the fairytale world of The Nutcracker. How Dariescu managed to communicate the complex and ravishing beauty of Tchaikovsky’s score (which was, after all, written for an orchestra) with one piano and one pair of hands I cannot say. But it was a visual and aural delight. And so lovely to think that young children sat listening to an hour of music played at such a high level without losing interest. Pictured top: Joel Bray in Biladurang. Photo: Victor Frankowski.